Sonic & All-Stars Racing Transformed[a] is a kart racing video game developed by Sumo Digital and published by Sega. It was released for the PlayStation 3, Xbox 360, and Wii U in November 2012, for PlayStation Vita in December 2012, for Microsoft Windows in January 2013, for Nintendo 3DS in February 2013, and for iOS and Android in January 2014. The PS3 and Wii U versions of the game were released in Japan on May 15, 2014. Sonic & All-Stars Racing Transformed is the sequel to Sonic & Sega All-Stars Racing, the fourth installment in the Sega Superstars series, and the eighth racing game in the Sonic the Hedgehog series. The game was a launch title for the Wii U in North America and Europe. Sonic & All-Stars Racing Transformed is a mascot-based racing game in which players race against each other using over 20 characters from various Sega franchises, such as Sonic the Hedgehog, Jet Set Radio and Space Channel 5, although it features many new mechanics and improvements from the last game. The most obvious is that, at certain points in a race, vehicles can alternate between car, boat and plane modes. The car mode handles similarly to the previous game, in which players can earn boost by drifting around corners or performing tricks whilst in the air. Boat mode features true boating physics, requiring players to consider their vehicle's turbulence. They may also be affected by waves made in the water, some of which can be used to leap into the air and perform stunts. Plane mode, the fastest of the three forms, gives players the freedom to move both vertically and horizontally. Like the other modes, players can 'air-drift' around corners to earn boost and can also perform rolls to quickly adjust their position, earning boost for narrowly dodging obstacles. Players alternate between these modes by driving through blue transformation gates. Certain tracks in the game terraform as players proceed through them, offering different playstyles between each lap. Several new varieties of weapons have been added, including explosive hot rod engines, freezing snowballs, blowfish, and swarms of wasps that appear at the front of the pack. All-Star Moves return from the previous title, though these are awarded slightly differently compared to the last game, and can now be used in online multiplayer. During races, players can collect star tokens, found scattered around the course or earned by attacking opponents, which can be spent in a slot machine between events to earn random bonuses, such as enhanced items or faster recovery from certain weapons. The game's development staff contains members of Bizarre Creations, developer of Blur, Metropolis Street Racer, and the Project Gotham Racing series of racing video games, and of Black Rock Studio, developer of Split Second: Velocity and Pure. The console and PlayStation Vita versions run on a new internal engine, codenamed "Sumo", at 30 fps, while the 3DS version was built from the ground up. Longtime Sega music composer Richard Jacques handled the game's soundtrack, which features both original tracks and remixed Sega tunes. The development team cites Wave Race and Hydro Thunder as their inspirations for the water-based racing segments. At E3 2012, it was announced that JR Motorsports NASCAR Nationwide Series driver Danica Patrick would be appearing as a playable guest character in the game. She drives the "Danicar", a vehicle co-designed by Patrick for Mattel's Hot Wheels toyline. The game also features Ralph from the animated Disney film, Wreck-It Ralph, in which Sonic, Dr. Eggman, and other Sega characters make cameo appearances. Ristar makes a cameo appearance as the game's flagman. The Xbox 360 version also features playable Avatars, while the Wii U and Nintendo 3DS versions include playable Miis. A Bonus Edition of the game was available for pre-order or to get after release as long as it was available, which included Metal Sonic as a playable character, OutRun Bay, and additional stickers for the player's license. A port of the game for Microsoft Windows was released in January 2013 and featured additional exclusive characters, including characters from Valve's Team Fortress 2. In response to fans requesting additional characters as downloadable content, game director Steve Lycett posted on Sega's official forums, challenging them to organize a vote to nominate characters for him to recommend to Sega. Seven characters were chosen for recommendation, including Ryo Hazuki, Hatsune Miku, Segata Sanshiro, Vectorman, ToeJam & Earl, Bayonetta, and Ristar. On January 24, 2013, Lycett confirmed that one of those characters had been approved for development, later revealed to be Ryo Hazuki. An additional character, General Winter from Company of Heroes 2, was released as part of a free update for the PC version on July 4, 2013. On August 5, 2013, Willemus from Total War: Rome II was also added to the PC version as a free update. As part of a collaboration with The Yogscast and Humble Bundle, Yogscast's Simon Lane was released as a downloadable character for the PC version on December 6, 2013, with all proceeds going to charity. A stream by The Yogscast also showed Ryo Hazuki from the Shenmue series riding arcade machines. On January 14, 2014, Ryo became available for purchase as a DLC on Steam for the PC version. Due to technical issues, the iOS and Android versions were taken down soon after their release. The game has received positive reviews. It holds a Metacritic rating of 82 for the Xbox 360 and PlayStation 3 versions, 78 for the Wii U version, and 79 for the PC version. IGN gave the game a score of 8.6, calling it "a bright, handsome and thoroughly enjoyable ride." Destructoid gave the game 8/10, saying "Sega has cherry-picked the best elements of kart racers and applied it to the best arcade racing games to create a sleeper hit that’s great fan service and great fun." GameTrailers gave the game a score of 8.7. One of the highest reviews the game received was a 5/5 from the Daily Mail, who says it's "A game that stands head and shoulders above every carting game of recent years, and one – like the titles it pays tribute to – that will be remembered and cherished." Empire stated that "Sonic's second turn behind the wheel is a surprisingly complex offering, a kart racer that provides both an immediate surface appeal to newcomers and enough 'fair frustration' to maintain the interests of seasoned race gamers chasing that perfect result," giving the game 4/5 stars. GameSpot writer Britton Peele gave positive reviews to the Xbox 360 and PlayStation 3 versions of the game, but gave a more mixed review to the Wii U version. While Peele described the title as "far from a poor man's Mario Kart", the Wii U version received a day-one patch that appeared to render the game's Boost Race levels unwinnable. Peele also said the Wii U version's online Battle mode levels were also broken, with characters spawning in mid-air and collectable items for one of the version's exclusive modes not appearing at all. Sumo Digital has since released a patch to address the respective issues. 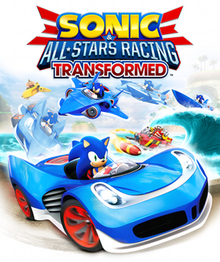 Sonic & All-Stars Racing Transformed received a nomination for "Best Racing Game of 2012" from GameTrailers. As of March 2013, the game has sold 1.36 million copies worldwide. ^ Japanese: ソニック& (アンド)オールスターレーシング トランスフォームド, Hepburn: Sonikku ando Ōru-Sutāzu Rēshingu Toransufōmudo? ^ Oliver, Tristan. "UPDATE: New EU ASR Transformed Trailer Released". TSSZ News. Retrieved August 7, 2012. ^ "Sega: Wii U's Sonic & All-Stars Racing Transformed Will Be Released On November 20th". My Nintendo News. July 24, 2012. Retrieved August 7, 2012. ^ Phillips, Tom (July 12, 2012). "Sonic & Sega All-Stars Racing Transformed release date". Eurogamer.net. Retrieved August 7, 2012. ^ a b @ (February 13, 2014). "『ソニック＆オールスターレーシング トランスフォームド』ソニックと仲間たちが陸・海・空を舞台にレースで激突!". Famitsu.com. Retrieved May 14, 2014. ^ "Sonic Races Onto Wii U Launch Line-Up in UK". The Sonic Stadium. September 18, 2012. Retrieved November 9, 2012. ^ "American Wii U owners get SASRT two days early". The Sonic Stadium. September 18, 2012. Retrieved November 9, 2012. ^ a b "Sonic & All-Stars Racing Transformed on Steam". Store.steampowered.com. January 31, 2013. Retrieved August 15, 2013. ^ a b "Stellar Line Up Coming to Mobile & Tablets". Sega of America. October 21, 2013. Retrieved December 14, 2013. ^ Bryant, Paul (October 9, 2012). "Sonic & All-Stars Racing Transformed races to NYCC with a new Gameplay Modes trailer". Gaming Age. Retrieved November 9, 2012. ^ Robinson, Andy. "CVG – Sega All-Stars Racing Transformed blasts off – First screens". Computerandvideogames.com. Retrieved May 1, 2012. ^ Daniel Krupa. "IGN – SEGA Unveils Sonic & All-Stars Racing Transformed". Ds.ign.com. Retrieved May 1, 2012. ^ Oliver, Tristan. "ASR Transformed Coming to Japan". TSSZ News. Retrieved May 14, 2014. ^ "Watch Now: 30 min of New All Stars Racing Transformed Gameplay". The Sonic Stadium. October 15, 2012. Retrieved November 9, 2012. ^ a b c "Steve Lycett answers fan questions on SASRT". Sonic Stadium. May 2, 2012. Retrieved July 6, 2012. ^ a b c d e Welsh, Oli. "Sonic and All-Stars Racing Transformed Preview: The Saviour of Arcade Racers". EuroGamer. Retrieved May 1, 2012. ^ "Sonic & All-Stars Racing Transformed Hits 3DS". Nintendo Life. Retrieved May 1, 2012. ^ Chris Schilling. "IGN – Rev Up For Sonic & All-Stars Racing Transformed". Uk.xbox360.ign.com. Retrieved May 1, 2012. ^ Oliver, Tristan. "Lycett: No ASRT 3DS Showcase Due to Framerate Problems". TSSZ News. Retrieved November 9, 2012. ^ Oliver, Tristan. "New Details on ASR Transformed for Wii U". TSSZ News. Retrieved November 9, 2012. ^ "Exclusive: Sonic ASR Transformed music preview". Destructoid. Retrieved November 9, 2012. ^ Oliver, Tristan (April 30, 2012). "TSSZ – Sonic & All-Stars Racing Transformed Revealed". Tssznews.com. Retrieved May 1, 2012. ^ "Danica Patrick on her new Sonic racing game: 'I shoot balls of flames'". CNN.com. December 18, 2012. Retrieved February 23, 2013. ^ "SEGA Blog | Danica Patrick Hits the Track in a Transforming Hot Wheels Car in Sonic & All-Stars Racing Transformed". Blogs.sega.com. Retrieved November 9, 2012. ^ "Comic-Con: How 'Wreck-It Ralph' infiltrated the game industry | Hero Complex – movies, comics, fanboy fare – latimes.com". Herocomplex.latimes.com. July 13, 2012. Retrieved August 7, 2012. ^ "Sonic & All-Stars Racing Transformed Preview". VE3TRO. October 9, 2012. Retrieved November 9, 2012. ^ "SEGA Blog | Sonic & All-Stars Racing Transformed Bonus Edition Announced". Blogs.sega.com. Retrieved August 7, 2012. ^ "Sega forum DLC ideas". Sega forum. Sega. Archived from the original on January 22, 2013. Retrieved January 18, 2013. ^ "Sega DLC character discussion". Sega forum. Sega. Archived from the original on December 3, 2013. Retrieved January 18, 2013. ^ Oliver, Tristan. "Lycett Confirms "Approval" for Potential ASR Transformed Character DLC". TSSZ News. Retrieved August 15, 2013. ^ "Steve Lycett: "We're not done with ASRT yet"". The Sonic Stadium. July 4, 2013. Retrieved August 15, 2013. ^ a b Sarkar, Samit. "Roman general added to Sonic & All-Stars Racing Transformed PC". Polygon. Retrieved September 1, 2016. ^ Ruscher, Wesley. "Race as Yogscast in Sonic & All-Stars Racing Transformed". Destructoid. Retrieved September 1, 2016. ^ "Yogscast Livestream Leaks Ryo Hazuki in Sonic & All-Stars Racing Transformed". GameTrailers. December 17, 2013. Retrieved May 14, 2014. ^ "Sonic and All-Stars Racing Transformed: Ryo Hazuki on Steam". Store.steampowered.com. January 14, 2014. Retrieved May 14, 2014. ^ "Sonic & All-Stars Racing Transformed". AppShopper. Retrieved January 10, 2019. ^ "Android Apps on Google Play". play.google.com. Retrieved January 10, 2019. ^ a b "Sonic & All-Stars Racing Transformed for Xbox 360 Reviews". Metacritic. CBS Interactive. Retrieved June 5, 2013. ^ a b "Sonic & All-Stars Racing Transformed for PlayStation 3 Reviews". Metacritic. CBS Interactive. Retrieved June 5, 2013. ^ a b "Sonic & All-Stars Racing Transformed for PC Reviews". Metacritic. CBS Interactive. Retrieved December 27, 2013. ^ a b "Sonic & All-Stars Racing Transformed for Wii U Reviews". Metacritic. CBS Interactive. Retrieved June 5, 2013. ^ "Sonic & All-Stars Racing Transformed". Metacritic. ^ a b Pinsof, Allistair. "Destructoid review". Reviews, news and online community. Destructiod.com. Retrieved January 18, 2013. ^ Schilling, Chris. "The metamorphosis of the kart racer". Game reviewer and news. IGN. Retrieved January 18, 2013. ^ "Gametrailers review". Gaming news. Gametrailers.com. Retrieved January 18, 2013. ^ Musa, Talal (November 19, 2012). "Mail Online review". Mail Online. Retrieved January 18, 2013. ^ Kamen, Matt, "Sonic And All-Stars Racing Transformed review", Empire. ^ Britton Peele (November 20, 2012). "Sonic and All Stars Racing Transformed (Xbox 360)". GameSpot.com. CBS Interactive, Inc. Retrieved November 29, 2012. ^ Britton Peele (November 20, 2012). "Sonic and All Stars Racing Transformed (PS3)". Gamespot.com. CBS Interactive, Inc. Retrieved November 29, 2012. ^ a b c Britton Peele (November 20, 2012). "Sonic and All Stars Racing Transformed (Wii U)". Gamespot.com. CBS Interactive, Inc. Retrieved November 29, 2012. ^ "Best racing game nomination". Gaming news. Gametrailers.com. Retrieved January 18, 2013. ^ "FY Ended March 2013 Full Year Results Presentation" (PDF). Sega Sammy Holdings. May 13, 2013. Retrieved August 15, 2013.